“Giant-killing”, in any sport, is a delightful event. For some reason – associated, no doubt, with the sado-masochistic element present in everyone’s DNA – we do enjoy seeing someone or something “big” crushed/thrashed/walloped/slain by something small. Think of Muhammad Ali versus Sonny Liston (1964 & 1965). and 2015 Chelsea 2 Bradford City 4. An also-ran – but not quite a giant-slaying, was surely this result: Cambridge United [76 places below Manchester United] hold Man Utd 0-0 (January 2015). Perhaps the English language has the best tools for describing such events: look at the the words I have just used –crushed/thrashed/walloped/slain!! Their very sound conveys a certain wicked aggressiveness of its own. I am sure that if you follow English football, you have heard even worse more derogatory references made to the time such-and-such a club (say Norwich City) wiped-the-floor-in 1912 with a bigger club (Sheffield Wednesday) or Wrexham, 92nd/last in the previous season’s league, humiliated reigning league champions, Arsenal, in 1992. Cricket, which is currently exhibiting one of its most exciting tournaments, the World Cup [of One-Day matches] is also full of instances of “giant-killing”. On 16 February 2015, Ireland beat the West Indies – the country that won the first two World Cup tournaments. The last two editions of the tournament had seen Ireland establish themselves as the game’s leading giant-killers: Ireland defeated Pakistan in 2007 and in 2011, they beat England. If anyone had predicted, before the match, that Ireland would beat England, he would have been told to go and see a psychiatrist. For England, together with India, Australia, Pakistan, Sri Lanka New Zealand, South Africa and [until recently] the West Indies, is thought of as one of the indomitable stalwarts of world cricket. What really rankles with Porterfield is that, after proving themselves over such a long period on the world stage, Ireland is still regarded as an “associate” member of the International Cricket Council, excluded from the club of elite Test-playing nations. And when the next World Cup is contested by 10 rather than the current 14 nations, Ireland faces being left even further out of the old boys’ club of the ICC’s “member” nations. Porterfield’s team won their opening Pool B match by four wickets in Nelson, chasing down the West Indies score of 304 for seven with 25 balls to spare thanks to half-centuries from Paul Stirling, Ed Joyce and Niall O’Brien. They were coasting towards an even-more emphatic victory at 273 for two when they suffered the sudden loss of four wickets, slipping to 291-6 and sending pulses racing. But Porterfield never doubted his team was in control. The trouble is that in world cricket, especially in what are called “limited-overs” cricket, there is no respect for reputation. Once you meet a country, no matter how lowly its status is supposed to be, you must perform or perish. 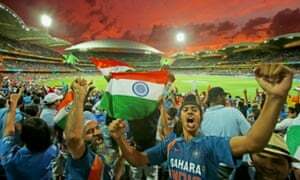 In fact, that uncertainty is one of the most attractive aspects of international cricket. 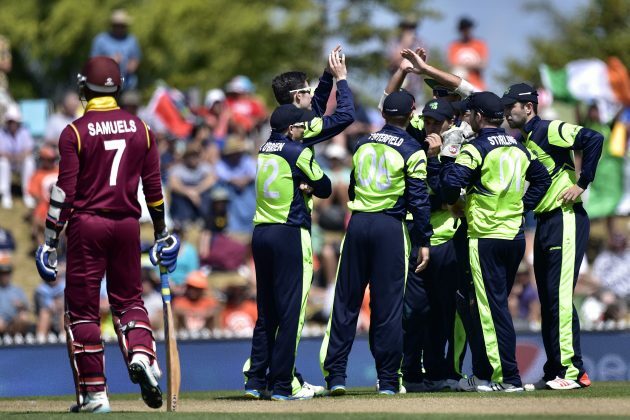 In beating the West Indies, Ireland caused the first shock of the current World Cup. Ireland won with a four-wicket triumph against West Indies in their opening Pool B match, played in Nelson, New Zealand. Lendl Simmons (102) shared 154 with Darren Sammy (89) as the West Indies recovered from 87-5 to post a total of 304-7. But Ireland’s Will Porterfield and Paul Stirling put on 71 and Stirling (92) then shared 106 with Ed Joyce (84). Niall O’Brien added 79 not out, as Ireland won with 25 balls left. Ireland had, in earlier years, signalled its intention to become a leading “giant-killer” by beating Almighty Pakistan, in Ireland’s very first World Cup in 2007 Ireland next beat the traditional originator/”owner”/ “custodian” of the game — you’ve guessed it, England itself — in the 2011 World Cup tournament! The only consolation for the West Indies in the match they lost to Ireland in New Zealansd is that two of their nationals (who are related to each other) – Phil and Lendl Simmons – each scored a personal triumph in his own way. Phil, a former West Indies hard-hitting batsman, is now the coach of Ireland, while Lendl, his nephew, was the only West Indian batsman to get the better of the Irish bowlers, with a score of 102. Nelson must have been the scene of a “Simmons” mother-of-all-parties after the match – unless, of course, there was a “curfew” that prevented players from “over-fraternising” after matches. Especially players from opposing sides! Of the current West Indies team, the Correspondent wrote: “If an embarrassing past few months is anything to go by, the Windies are so inept they may struggle to even qualify for the next edition of the 50-over showpiece in four years’ time, with the field for 2019 [due] to be cut to [only] 10 teams. [Against Ireland,] lower order hitters Lendl Simmons (102) and Darren Sammy (89) did their best to save face and push the total past 300, but overall, the Windies were lacklustre. “For the rest of this World Cup,” the Telegraph Correspondent added, “their selfish and pampered players and incompetent board must prove they deserve any more credence than the associate nations. How then are the mighty fallen! And, again, that is part of the excitement about cricket. Who would have thought, for instance, that Bangladesh, once a mere province of Pakistan, known as East Pakistan, would ever have been able to bring its former “mother”, Pakistan, to its knees in a World Cup match? Yet Bangladesh did beat Pakistan in the 1999 World Cup. Then imagine Zimbabwe, only three years after rejoining the international community, following years of being a pariah, as a result of Ian Smith’s Unilateral Declaration of Independence in 1965, getting the better of mighty Australia in 1983! And Kenya – who would have betted on Kenya being able to beat the World Champions-to-be, Sri Lanka? Yet Kenya did it in 2003! In other words, the “minnows” have a chance in World Cup cricket that their counterparts in the Football World Cup don’t seem able to enjoy.For this “chancy” element in cricket alone, I would urge Ghana’s sports authorities to do their best to support the activities that the Ghana Cricket Association is currently mounting to popularise cricket in Ghana. Ghana might get a chance to get into the minor international leagues, and eventually appear on the world stage. But it must be pointed out that unlike football, cricket does need resources to enable it to take off. You don’t just get up, find a ball and a field, and hey presto, you are playing cricket – as you can do with football. You need a specially prepared pitch, kept in top condition by expert “groundsmen” known as the wicket. You need a scoreboard and people to man it. The individual player must be equipped with protective clothing – gloves for his fists and pads for his legs. As well as a few things that I’d better not mention here! It all needs money. But the enjoyment is fantastic. Cricket is a bit difficult to understand at first, but all it needs is one or two articulate chaps, armed with a laptop, to be able to explain it and convey the thrill in it to anyone of average intelligence. Come on Ghana! Pad up! The world is waiting for you!